THIS MEDAL CAN BE WORN BY ANYONE WHO HAS MILITARY SERVICE. A SUPERB SILVERED FINISH MEDAL WITH A CRIMSON RIBBON. 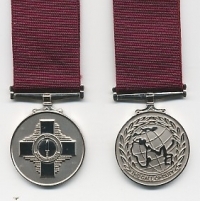 THE MEDAL IS SUPPLIED MOUNTED ONTO A PIN BROOCH BAR READY FOR WEARING.